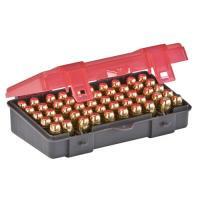 Every shooter wants their ammunition to be readily accessible and kept secure. Plano offers the 122750 50-Count Handgun Ammo Case to meet both of these demands. Up to 50 rounds are easily accessible from their individual slots. The flip-top lid with double tabs and the option to add a small luggage lock retains bullets and maximizes security. Grooves in the box allow for convenient stacking, while use of the included stickers make labeling and organizing the boxes fast. The case is designed to hold .45 ACP, .40 S&W and 10-millimeter ammo. Don't let ammunition spill all over your range bag--corral it with Plano's ammo case.